Very few Netherlands stamps, specifically designated for use on Air Mail, were issued during the 20th Century. In the NVPH catalog, these air mail stamps are in a separate chapter called "luchtpostzegels". The catalog numbers begin with "1". Boes, Netherlands to Leningrad, USSR. Significant events in aviation history and in Air Mail transport did take place in the Netherlands during the early part of the 20th Century. However, the postage was usually paid in regular definitive Netherlands stamps, as is shown by the franking on the Graf Zeppelin flight card above. 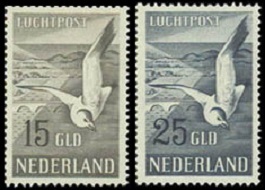 Most of the "Luchtpost" or "Airpost" definitive stamps of the Netherlands, after 1929, were actually issued ONLY for use during special flight events. The three Air Mail stamps shown above (NVPH #1-3, Sc. #C1-3) were issued on May 1, 1921. These are the only Netherlands stamps ever produced by the woodcut-letterpress printing process. The design of these stamps features a gull flying over the ocean, with the denomination tablet in the center. These stamps were originally issued to pay the Air Mail fees charged by the Dutch carrier, KLM Airlines. The use of these stamps was discontinued on June 1, 1922. In February 1923, these stamps were again placed on sale for general postal use, and the existing supplies were quickly sold-out. The two Air Mail stamps shown above (NVPH #4-5, Sc. #C4-5) were issued on August 20, 1928. They commemorate two of the Dutch Aviation Pioneers in the establishment of Air Mail service between the Netherlands and the Netherlands Indies (Indonesia). After April 29, 1931, these two stamps were placed on sale for general postal use, and as a result, they are plentiful and inexpensive today. The 75 C. denomination honors Captain Jan van der Hoop, one of the first Dutch aviators to attempt an Air Mail flight from the Netherlands to the Netherlands Indies in 1924. On October 1, 1924, Jan van der Hoop, along with a co-pilot and navigator, took off from Amsterdam in a single-engine Fokker VII. They carried 281 Air Mail items with them. Due to engine failure, the aircraft was forced to land in Bulgaria. A replacement engine was sent from the Netherlands and installed in the stranded aircraft, delaying the trip by over a month. The flight resumed, and the aircraft reached Batavia (Jakarta) on November 24, 1924. This epic flight attempt was never followed-up. The 40 C. denomination honors G. A. Koppen, a Lieutenant in the Netherlands Air Force. He is famous for his successful round-trip Air Mail flight from the Netherlands to the Netherlands Indies in 1927. On October 1, 1927, Koppen took off from Amsterdam in his three-engine Fokker VIIA, which had been christened "De Postduif" or "The Postal Dove". He carried a cargo of 2,092 Air Mail items on the flight. Ten days later, he landed in Batavia (Jakarta). His return flight from Batavia began on October 17, 1927, carrying a record cargo of 4,642 letters and cards, and landed in Amsterdam on October 28, 1927. Through this accomplishment, the 30 day mail transit time to the Netherlands Indies, by sea, had been reduced to only 10 days, by airplane. The three Air Mail stamps shown above (NVPH #6-8, Sc. #C6-8) were issued on July 16, 1929 to satisfy higher Air Mail postage rates. After April 29, 1931, these three stamps were also made valid for general postal use. The three designs feature Mercury, the Roman messenger of the gods. The 12 1/2 C. denomination Netherlands stamp shown above (NVPH #11, Sc. #C11) was issued in 1938 for use only on special flights. Its first use was on the First KLM Airlines flight to South Africa on October 22, 1938. The 25 C. denomination Netherlands stamp shown above (NVPH #14, Sc. #C12) was issued in 1953 for use only on special flights. Its first use was during the London-New Zealand Air-Race on October 8, 1953. The design of both these stamps features a crow in flight. The two Air Mail stamps shown above (NVPH #12-13, Sc. #C13-14) were issued on November 12, 1951. These two VERY HIGH denomination stamps were only valid for postage on Air Mail articles, probably large parcels. Only 69,400 of each denomination was printed. It would be safe to say that not many of these 15 Gulden and 25 Gulden stamps were ever sold or used for Air Mail (NL 40 Gulden in 1951 = US $10.00 in 1951). As a result, they are scarce and VERY expensive today. The design of these two stamps features a flying gull. The 25 C. denomination stamp shown above, at the left (NVPH #15, Sc. #C15), was issued on September 2, 1966 for use only on special flights. It was first used for Philips Technology's Diamond Jubilee Sightseeing Flights on September 24, 1966. The 1 G. denomination stamp shown above, at the right (NVPH #16, Sc. #C16), was issued on May 13, 1980 for use only on special flights. This stamp was first used on May 21, 1980. The 36 C. denomination stamp shown above (NVPH #9, Sc. #C9) was issued on September 24, 1931. Though it was not actually issued as an Air Mail stamp, the denomination paid the Air Mail letter rate to the Netherlands Indies. The design features Queen Wilhelmina and airplanes. The 30 C. denomination Air Mail stamp shown above (NVPH #10, Sc. #C10) was issued on October 9, 1933 for use only on special flights. 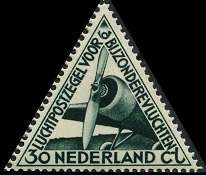 This stamp was first used on the record setting flights of the "Postjager", "Zilvermeeuw", and the "Pelikaan" to the Netherlands Indies in December 1933. The stamps were withdrawn from sale after these flights. After March 1937, these stamps were again made available to the public, but they were not valid for postal use. The design features the propeller of a Fokker Pander.